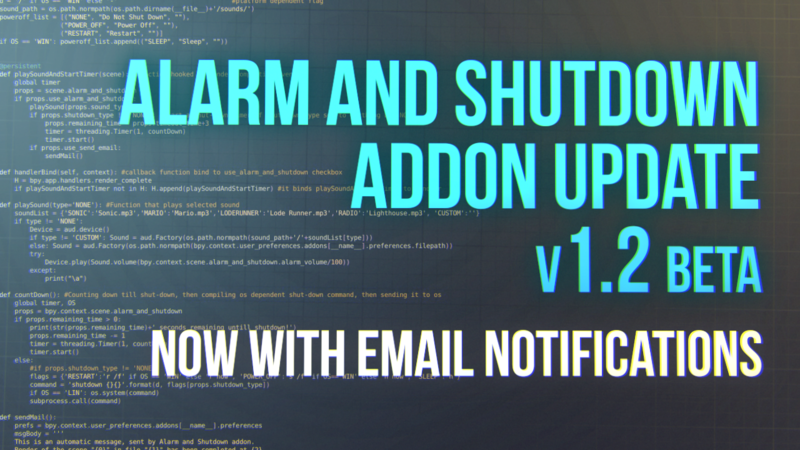 Here's a little update of my trusty old addon "Alarm and Shutdown", to version 1.2 beta. Oh, and of course, version for Blender 2.8 is also available now! You can get it for free at Gumroad. 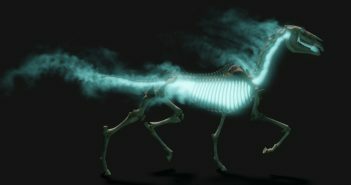 Can it also send the rendered image as attachment? That would be cool! Hi! Does it work for Linux (Ubuntu 18.04)? Very cool addon! Great thanks! I've tested it on virtual box (Ubuntu 18)- worked fine there. Super-duper!!! I've just tasted and this works well in b2.79. This shuts down after a render and after an animation also! Previous version (I don't know yours addon or not) I tried to use (about 2 years ago) and had no success in Linux. Now I've got an amazing tool! Big thanks! May be it could me useful information to you or may be I've missed something. It's about installing the addon in Linux (ubuntu18.04). 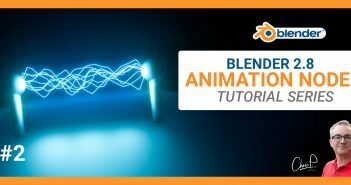 When I tried to install it through the button "Install Add-on from File..." - blender doesn't see the "alarm_and_shutdown_v1.2.1 Beta for Blender_2.7x. rar" file you offer to download. So I've unpacked it as the "alarm_and_shutdown" folder and put it into "~/.config/blender/2.79/scripts/addons" - but blender didn't see it. Next step I simply took "__init__.py" from the unpacked "alarm_and_shutdown" folder and put it into "~/.config/blender/2.79/scripts/addons" straight as it is - again blender didn't find the addon. Only when I renamed the file "__init__.py" to "alarm_and_shutdown.py" - blender began to see it. Also the folder "sounds" must be pasted straight into "~/.config/blender/2.79/scripts/addons", otherwise blender can't find the default music files. So, :) To make a usual installation possible I've packed "alarm_and_shutdown.py" and "sounds" into "alarm_and_shutdown.zip" and checked - all installs through the button "Install Add-on from File..." and works fine!! I added this to my gumroad library but now I've only got access to the 2.79 version, and attempting to add the 2.8 version just gives me a "You've already purchased this item" message, and it keeps on re-downloading the 2.79 version. Having both in the same rar file might be a better solution going forward, especially since most 2.8 users also use 2.79 for stable-work. Can you suggest how to access the 2.8 version please?